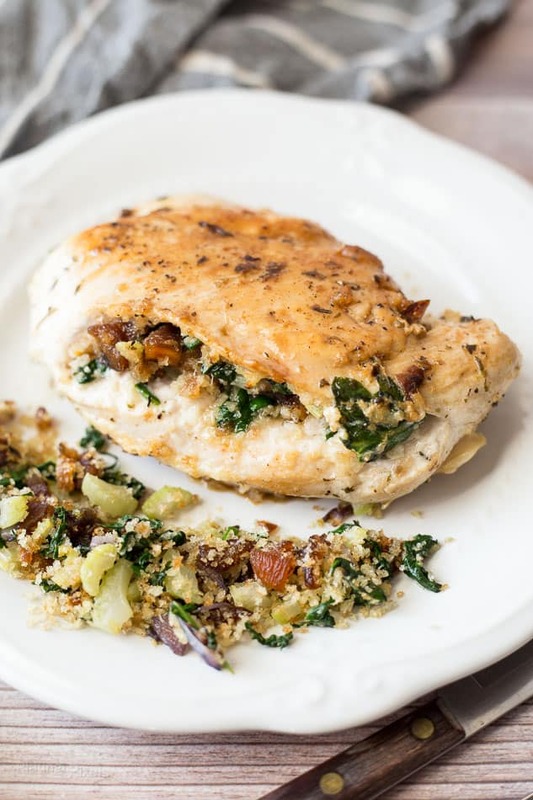 Just a few common ingredients create a classic stuffing flavor in these wholesome Apricot and Spinach Stuffed Chicken Breasts. One bite and you’re transported to family favorite meals of the past. Comfort food was a cherished memory as a child. Dinner time was an important ritual in our household and often consisted of rich, carb-heavy food. Those starchy, creamy and cheese-based foods hold an important place in my heart, but my new comfort food favorites are lighter and healthier, and can be enjoyed on a more regular basis. Today’s comfort food is food you feel comfortable eating. 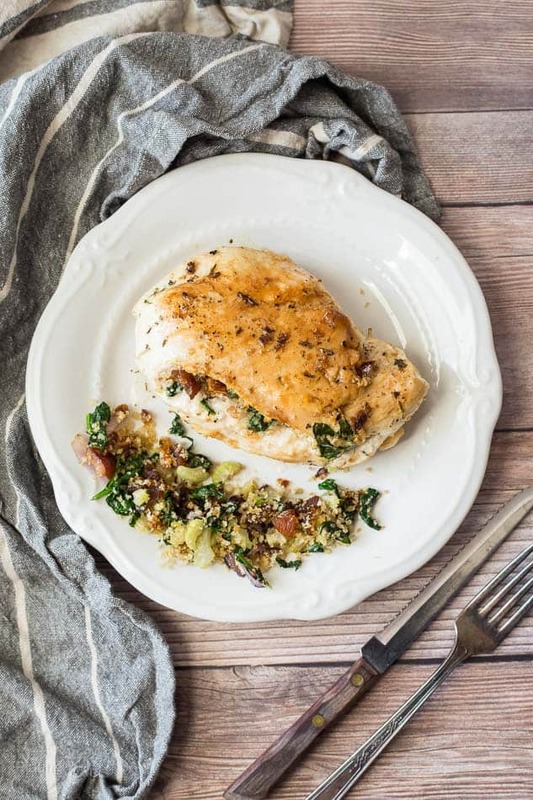 These Apricot and Spinach Stuffed Chicken Breasts are a prime example of that. Ideal for cozy fall meals, holiday entrees, or easy chicken dinner recipes, it’s a simple dish full of fresh, clean, and wholesome ingredients. Besides vegetables, lean protein is the biggest part of my diet. Quality meat means quality nutrients that help support a healthy lifestyle. I feel great knowing my chicken is vegetarian fed and locally grown, without unwanted additives. 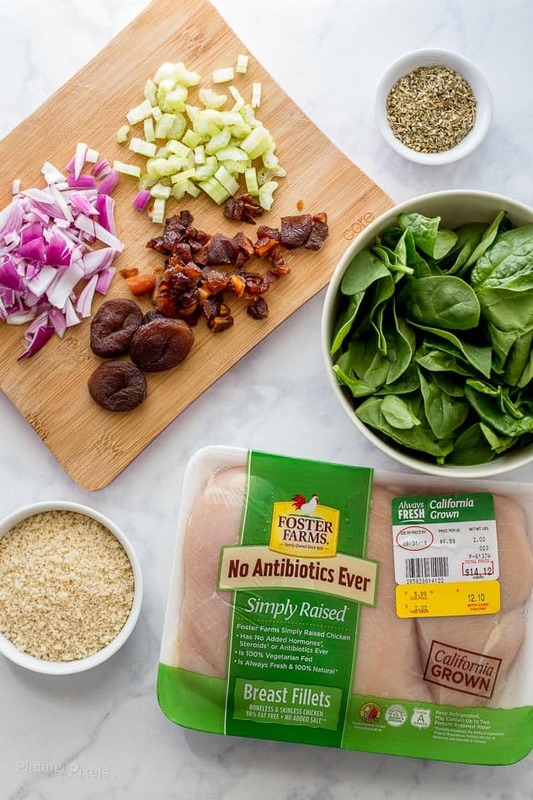 As part of your new comfort food routine, look for Simply Raised Chicken, along with fresh and organic vegetables, for easy and flavorful comfort food recipes you’ll remember for years to come. Heat olive oil in a large skillet or nonstick pan. Add celery, onion, Italian seasoning and salt and pepper to taste. Cook until tender. Stir in spinach, dried apricots and panko crumbs. Cook until spinach is wilted. Remove from heat. On a flat surface, pound chicken breasts flat with a mallet. Remove breasts and carefully cut a slit horizontally into the sides to create a pocket. Evenly stuff with prepared stuffing mixture. Lightly sprinkle both sides with salt and pepper, and remaining Italian seasoning. If desired, secure opening with toothpicks. Heat olive oil in a cleaned pan to medium-high heat. Add chicken and cook until lightly browned. Rotate and brown the other side. Cover and cook until done. Tips for stuffing: Stuffing chicken breasts is super easy all you need to do is create a pocket for stuffing. To do this, cut the breast using a sharp knife starting from the middle of the thickest part of the breast. Cut diagonally until you have created a pocket, be careful not to cut all the way through. Pro Tip: Secure the filling with wooden toothpicks to ensure nothing escapes during cooking. If you are unsure if the chicken is cooked all the way through you can use a meat thermometer to check. Once the internal temperature reaches 165 F the chicken is cooked and ready. Rest for 5 minutes before serving to hold in moisture and create moist stuffed chicken breasts. If you’re interested in learning more about chicken cooking methods check out my guide for How to Bake Chicken and How to Grill Chicken Breast on a Gas Grill. These are great guides with lots of tips and tricks for cooking chicken breasts perfectly! Pound chicken breasts in a Ziploc bag or covered in plastic wrap for easy cleanup. Pound the chicken with a meat mallet or rolling pin to make them larger and flatter. When cutting a pocket to stuff be careful not to cut the chicken in half. You can prep the chicken in advance, stuff them with the filling and keep in the fridge 1-2 days covered until you are ready to bake. Whole wheat breadcrumbs are a more nutritious alternative to white breadcrumbs. Use GF breadcrumbs if needed. Use a meat thermometer if unsure the chicken is cooked through. Leftovers can be stored in a sealed container in the fridge for 2-3 or freeze for longer storage. These stuffed chicken breasts are great served with a fresh salad or grilled or roasted vegetables such as eggplant, zucchini, and potatoes. They’d also be delicious served with mashed potatoes or squash if you’re looking for extra comforting sides. Flavor profiles: Savory herbed chicken with fruity apricot stuffing center. Texture: Tender moist chicken with fluffy filling. Dietary Options/Substitutions: Use gluten-free bread crumbs if needed. 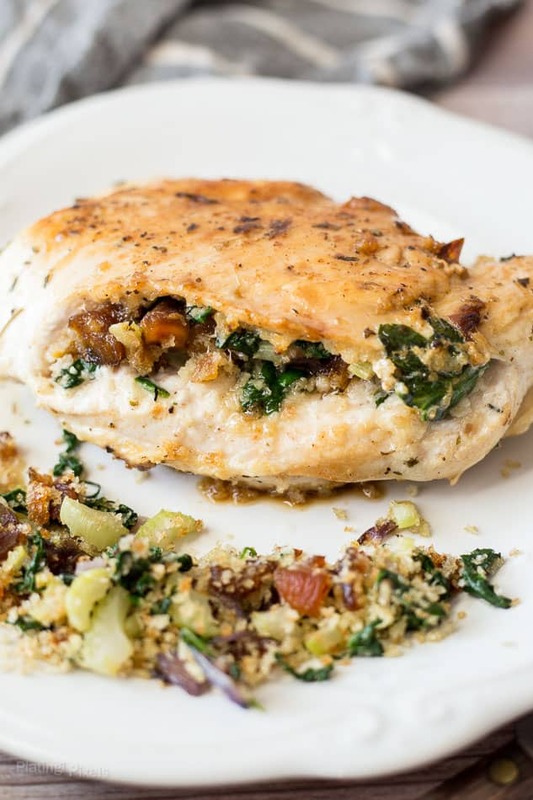 No elaborate stuffing recipe is needed to create these Apricot and Spinach Stuffed Chicken Breasts. Just a few ingredients create a classic stuffing flavor with dried apricots. Heat 1-tablespoon olive oil to medium heat in a large skillet or nonstick pan. Add celery, onion, ½-tablespoon Italian seasoning and salt and pepper to taste. Cook until tender, 5-7 minutes, stirring often. Stir in spinach, dried apricots and panko crumbs. Cook 2-3 minutes more, until spinach is wilted. Remove from heat. On a flat surface, pound chicken breasts flat with a mallet to about ¾-inch thick. Remove breasts and carefully cut a slit horizontally into the sides to create a pocket; do not cut completely in half. Heat remaining olive oil in a cleaned pan to medium-high heat. Add chicken and cook until lightly browned, about 2-3 minutes. Rotate and brown the other side. Reduce heat to medium, cover, and cook 7-10 minutes more, or until chicken reaches an internal temperature of 165° F. Let rest 5 minutes and serve. I love stuffed chicken breasts, and this filling sounds like a winner, The apricots are an ingredient I haven’t tried for this. Now I need to! It’s a great pairing and hope you like it! Thanks. Glad you liked the recipe Lauren! That’s a good point. I’m bet kids would love this and not mind the spinach with the other flavors. Love the ingredient combination in this chicken. Such a nice and healthy dinner option! I’m making it next week! already added it to our menu. One question, we get frozen spinach, can I use it or should I substitute it for chard? That’s awesome Lizet! Good question. I’m pretty sure you could but would defrost or warm up first before adding. Thanks! I found fresh spinach. Such a delicious recipe! It’s a keeper. This would be perfect for date night at home! What a yummy combo of flavors! It sure would! Thanks Sara. Your Whole Wheat Ham and Cheese Scones look simply inviting to my senses, I have been looking for new breakfast ideas and this is fab! Thank you for sharing! That’s what I call a perfect dinner. I’ve never tried the spinach and apricot combo before. Sounds intriguing! What a scrumptious looking meal! 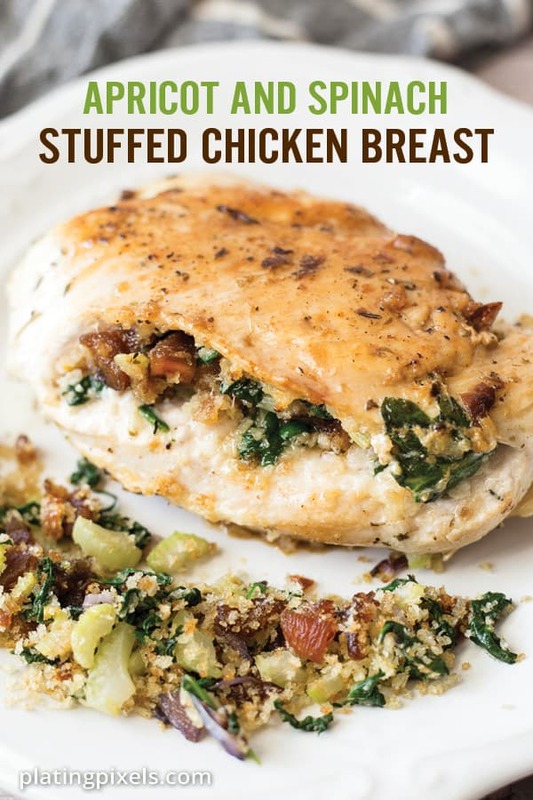 I love the flavor combo here, stuffed chicken is always an impressive meal. Say now! That looks and sounds & looks like a very nice meal. You have some great flavor & texture combos there. I love all these flavors together! This looks like a delicious and hearty winner of a recipe! Love everything about this! Apricot + spinach + chicken sounds like an awesome combo!